This was an interesting application that we thought would be nice to share with you. 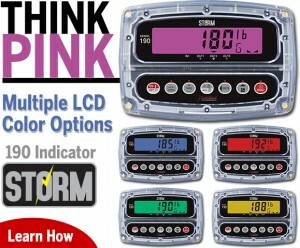 We might not typically think of the Cardinal 190 STORM indicator and breast cancer awareness as directly related, but Cardinal recently sold five 190 STORM indicators to a breast cancer awareness foundation that requested a PINK display option. The brilliant LCD color display possibilities are impressive in the 190 STORM… and more color presets are now available! Pink is now available as a LCD color option along with Blue, Red, Green, and Yellow. Five color preset options available add to the already-incredible features in this highly-popular IP69K wash down indicator with big, bold 1-inch-high digits and capacitive touch keys. It doesn’t matter if we are looking to buy a television or a treadmill, we all want to buy a product that has a solid warranty. Often times that warranty will only cover the parts that might fail, leaving you to pay for the extra expenses like labor and travel mileage. Avery Weigh-Tronix has now added an optional warranty which will be ideal for many truck scale customers. They call it the Blue Blanket truck scale warranty and for just a small investment, the optional 5-Year Blue Blanket Truck Scale Warranty (part number AWT97-501690) can be the perfect choice for a customer to protect their investment. The new ‘blue blanket’ warranty option can really add another dimension of long-term value to your AWTX truck scales. If you were to add this additional protection to your truck scale, the customer now has an option to use scheduled preventative maintenance to extend their warranty. This is great since these days some bid specifications call for a 5-year comprehensive warranty and this option fulfills that requirement. This ‘blue blanket’ includes all weighbridge components and indicator plus travel and labor at standard rates.